Jackfruit is in season year-round. Jackfruit contains Vitamins A, C, E, K and B6, antioxidants, potassium, fiber, calcium, and protein. Choose jackfruit with a bright green or yellow color and a fragrant scent. Leave jackfruit on the counter to ripen. Once ripe, it should yield slightly to pressure. Wrap cut fruit tightly in plastic wrap or airtight container and refrigerate up to 7 days or freeze for up to 2 months. To cut a ripe jackfruit, first make sure to wear a pair of gloves and cover your cutting board with plastic wrap. Oil a large knife and cut jackfruit into 2-inch slices. Cut the slices in half and run blade along the core line to separate the pods. Break pods off the skin and remove the white fibers and tip. Split pods lengthwise and remove seed and rubbery seed skin. The rest can be eaten! The seeds can also be boiled for 20-30 minutes and eaten. 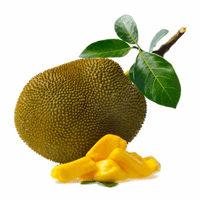 Ripe jackfruit can be eaten fresh or baked into a dessert. 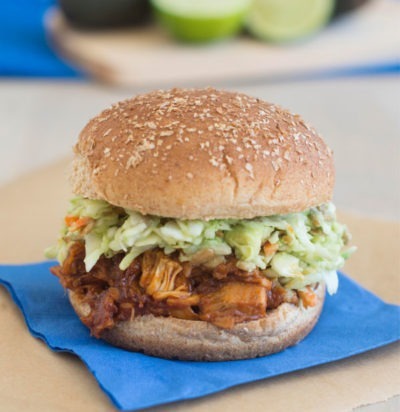 Unripe jackfruit can be used as a meat substitute in dishes like tacos, “pulled pork” sandwiches and more. Jackfruit is the world’s largest tree fruit, averaging 15-33 pounds each! The large fruit grows directly out of the trunk or branches of the tree. The exterior of the Jackfruit is covered with spiny, knobby bumps and is green in color. are those what I use to make meat dishes like pulled pork, tacos, & bbq? Also can I freeze these stringy strands and the fruit pods of jackfruit? Yes, you can use the strands of the jackfruit as a meat substitute. If the jackfruit it ripe, it might be too sweet though. You can also buy canned young (unripe) jackfruit that makes it much easier! Someone give me 3 kilo unripe jack fruit. I want to store it for 45 days what can i do? Let it sit until ripe, then you can cut it up and freeze for up to 2 months.